Organic colloids generally consist of bacteria, viruses, phages, fragments of cellular material from living organisms, waste food, and a variety of materials from the chemical and food processing industries. These organic colloidal pollutants can be deleterious. 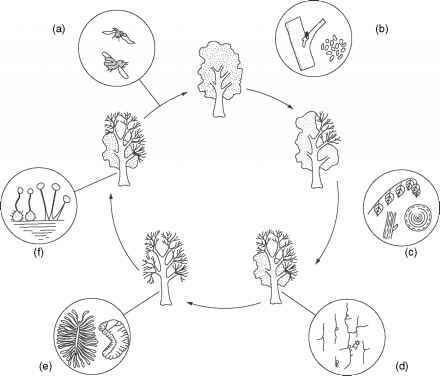 In addition, they also consume DO and create a potential for putrefaction during their biological degradation. The most important property of colloids is their very small size. Table 7.34.1 shows the size range in which colloidal materials are normally classed. Because of their size, colloids have a large surface area per unit volume, or per unit mass of material. The properties of this surface, or more specifically the interfacial region between the solid colloid and the bulk liquid (water) phases, governs the action of a colloidal suspension. The electrical properties at the solid-liquid interface depend on the origin of the solid surface and the physico-chemical properties of the solid and liquid phases. Solid particles encountered in wastewater treatment originate from three general sources including degradation of larger particles, biological agents, and condensation of small particles forming larger ones. When suspended in water, the surfaces of these solids exhibit a surface charge that can arise from the specific adsorption of potential determining ions, dissociation of ionic species at the surface, internal atomic defects in the solids phase, or other causes. This surface charge is counterbalanced by oppositely charged ions in the liquid adjacent to the solid-liquid interface. The distribution of ions in the region adjacent to the interface is different from that in the bulk of the solution and is described by the electrical double-layer theory. Figure 7.34.1 is a diagram of an electrical double layer based on Stern's modification of the Gouy-Chapman model. A layer of fixed, nearly immobile ions adjacent to the negatively charged surface reduces the surface potential to the Stern potential. Outside this fixed layer (called the Stern layer) is a diffuse layer of ions, whose concentration is described by a Boltzman distribution. 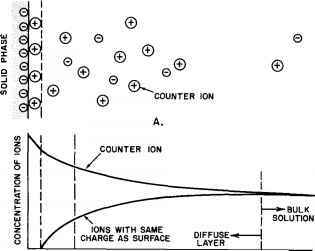 In the diffuse layer, an excess of positive counterions exists so that the total charge in the diffuse layer equals the total surface charge minus the total charge in the Stern layer.